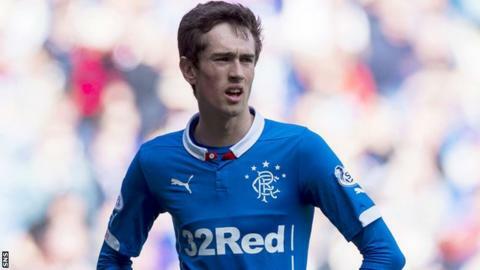 Rangers forward Ryan Hardie has signed a two-year contract extension which will keep him at Ibrox until 2018. The 18-year-old made his first-team debut in a League Cup win over Falkirk in September last year. This season, the Scotland Under-19 international has made two appearances as a substitute under Mark Warburton. "It's a great feeling to sign an extension. It is a massive club and I'm looking forward to doing my best here," he told the Rangers website. "I'm still young, just 18, but it's nice to know I'm in the manager's plans and he has liked what he has seen from me so far in training and in games." Warburton said: "He needs to work at his game but we have been delighted with him. "He works every day with the first team, he has a great attitude around the place and he is well liked, so we are thrilled to have him long-term and I'm sure he will go on to be a very strong player for Rangers."